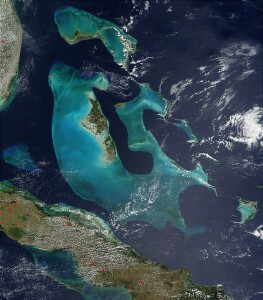 The Great Bahama Bank is a wide shallow body of water that lies generally between the westernmost islands of the Bahamas—the Biminis, Cat Cays, Gun Cay, etc.—and Andros, the largest island of the Bahamas. The sea here is less than twenty feet deep in places and coral heads are scattered throughout. In such a wide expanse of shallow water, a sailor must be conscious of wind, which can create substantial chop, and of the current, which flows in a northeast/southwest direction. The Great Bahama Bank is made of limestone deposits and, scientists believe, was exposed to the air during the last ice age when the sea level was substantially lower. The Florida peninsula is a similar deposit that is not submerged by the sea.